We are having a bird themed challenge this week at Merry Monday. Life has been a little crazy and I have taken a few weeks off from Merry Monday. So happy to be back. I can now finally get to my stamps in my craft room! The bird themed challenge was the perfect opportunity to ink up the To You and Yours Stamp Set. I have had this set in my collection for awhile now, but it had yet to see ink. I colored my bird and holly with Copics and fussy cut them out. I then layered them onto my card for more dimension. 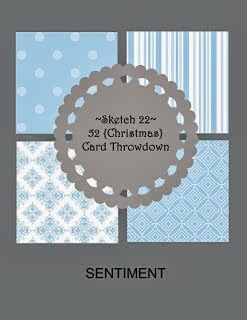 My card is based on the sketch challenge this week at 52 Christmas Card Throwdown. I added a few layers to the inside to balance out the weight from the front of the card. Hooray! So happy to see you back! Love your gorgeous card, the colours are rich and vibrant!!! It's so good to see you back at the creating table, Allisa! I've missed you. 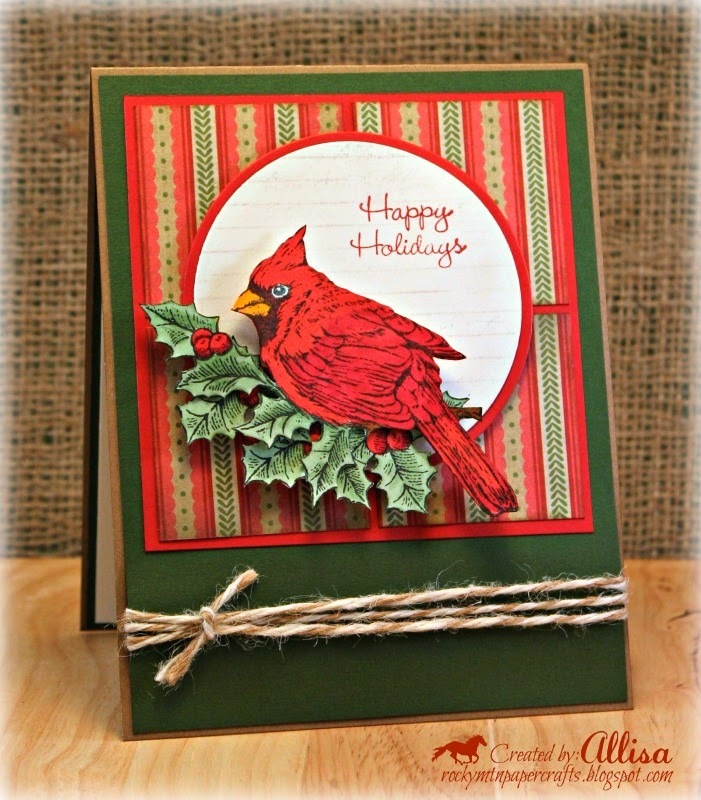 Love this beautiful cardinal and the perfect paper and twine! Have a good week. So glad you're back with us...and what a beauty to come back with! Love it! Beautiful card. 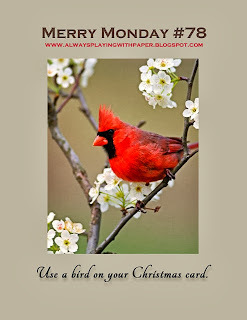 Love your colored cardinal and the papers you used. 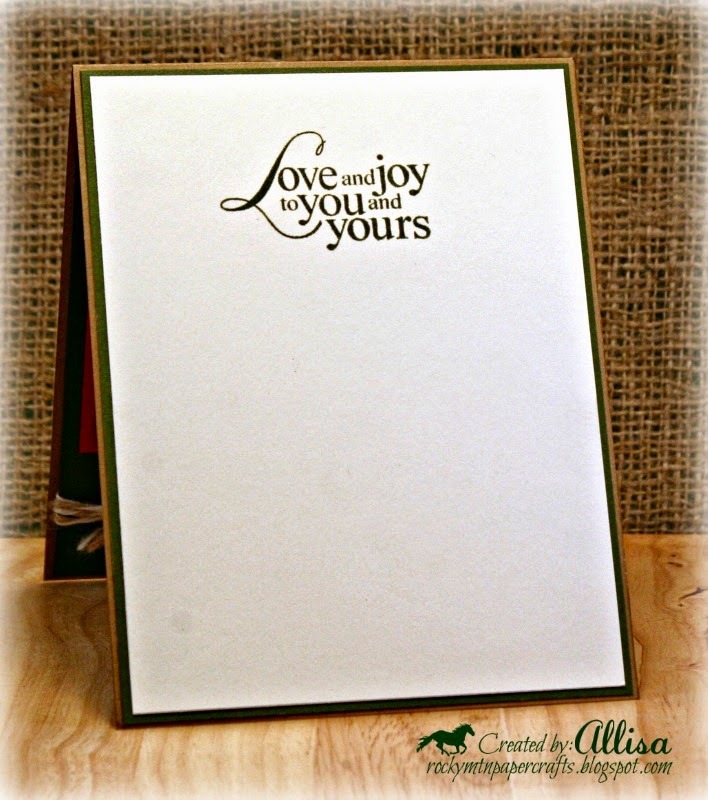 It is wonderful to have you back creating with us Allisa, your card is beautiful. I love the papers and fabulous greenery. LeAnne said exactly what I was going to say! Gorgeous card both the coloring and the papers you used. Stay safe and sane! A beautiful traditional Christmas card - love the cardinal, so pretty. Thanks so much for playing along with 52CCT this week! Hi Allisa, what a beautiful card and your coloring is fantastic! I'm so glad to be working with you on the MM DT. My mother was a CM consultant in NZ and has just signed up with CTMH. Consequently I've got an order of CTMH stamps on their way to me at the moment. Can't wait! This is absolutely gorgeous! Your coloring is fantastic! So gorgeous. Your colors are rich and vibrant. Happy to see you back and proud of you for making a hard, necessary choice. Allisa the red you have used looks so good on the lovely green background. The Holly and bird are beautifully coloured. A gorgeous card. Welcome back Allisa! Love the colours and images you used, beautiful card. This is so gorgeous, Allisa. Love that beautiful bird and the DSP. Happy to be on the DT with you this month, too! Your cardinal is just beautiful sitting on the holly! Absolutely fabulous Allisa! So glad you found a reason to use this great stamp. Your fussy cutting in perfection. So glad that you joined us this week at 52CCT! This is a stunner for sure...your coloring is divine! 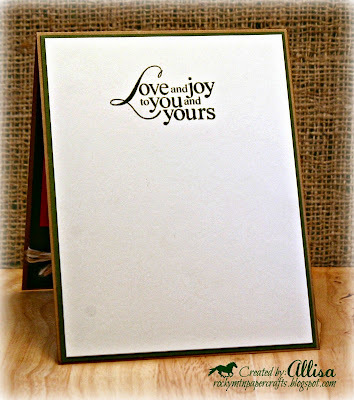 Simply lovely with the gorgeous coloring and all that fussy cutting! Thanks for joining in the fun at CSAYL! Beautiful card, Allisa! 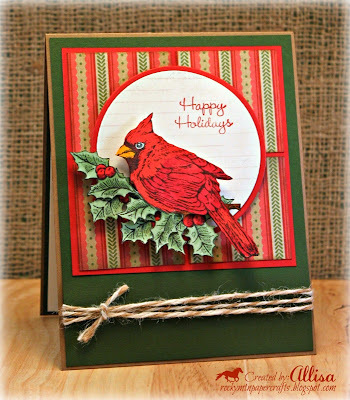 Love the paper and your pretty cardinal image! So glad your back!! So pretty! Love your take on the sketch. Your bird is amazing. Thanks for playing with CSAYL. Oh my goodness, what a BEAUTIFUL card Allisa! I love the fussy cut, popped up images and the traditional colour scheme! What a joy it will be for someone to receive this special card at Christmas! Beautiful card! I love the cardinal with the holly. Your dp is perfect!